The Summer 2018 edition of the YAACING newsletter is here! Be sure to read the whole thing for some excellent youth services ideas. Here’s our column, We’ll Link to That!, where we shared 10 upcoming Canadian titles we can’t wait to read. Want to catch up our column? Browse through the We’ll Link to That category on our Professional Development page. There are so many great Canadian books for kids coming out this year! We thought we’d take some time to share some of the titles we can’t wait to get our hands on. Mackay’s beautiful paper illustrations have stunned us before and this one looks to be a stunner too. A grandfather takes his grandchildren on a fishing trip that is filled with weather sayings. Sounds like the language will be beautiful too! 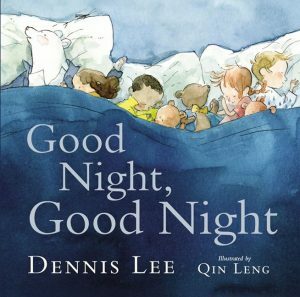 Dennis Lee’s poetry is timeless and seeing its resurgence in board book format does our verse-loving hearts good! 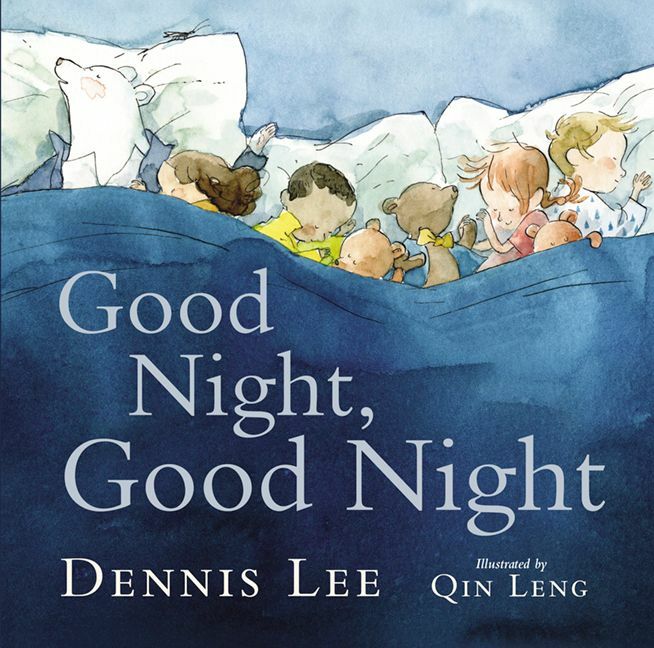 Pair Lee’s language with one of our favourite illustrators, Qin Leng, and this nighttime themed title is sure to be a gem. This board book was made for B.C. families! Victoria, B.C. 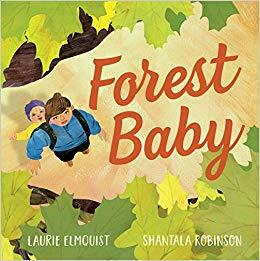 author Elmquist writes of a little one who hitches a ride in a backpack as they go on a hike through a forest. A great way to promote the outdoors. 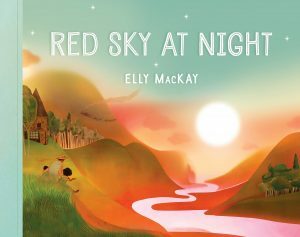 I think we’ve got ourselves a new Canadian wordless picture book superstar. 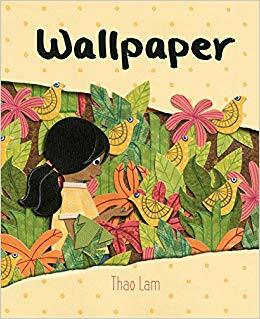 Lam is back with another wordless adventure featuring a shy girl who peels back the wallpaper in her new house to reveal an imaginary land. Ok, ok another poetry book – but bear with us! 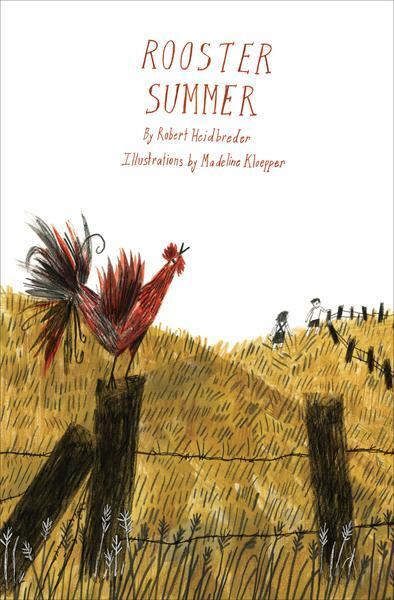 Usually Heidbreder’s work is combined with goofier illustrations but the more sophisticated images by Madeline Kloepper give this book a more serious tone and wider appeal. The story is based on Heidbreder’s experiences growing up on a farm and all written in verse, making it a perfect way to introduce poetry to pre-readers. The author came to Canada in 1979 as a refugee from Vietnam and it was this experience that informed this book. 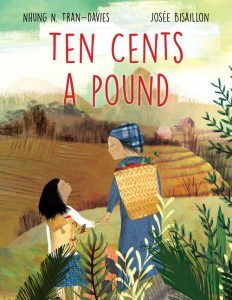 A mother urges her young daughter to leave their village to explore the greater world. This looks like a beautiful depiction of a mother-daughter relationship from an own voices author. 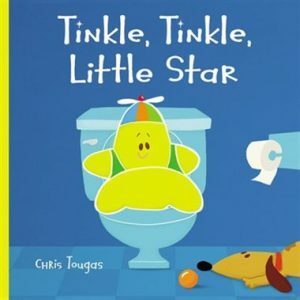 Finally a gender neutral book on potty training! This one looks funny and it can be sung to the tune of the classic nursery rhyme. An oft-requested topic by parents, this one is sure to fly off the shelves. It’s not our fault there are so many poetry based picture books being published- so let’s just embrace it, ok? This gorgeous lifecycle book has many levels of word-play on each page that will engage the attention of independent readers, or keep pre-readers coming back for more. 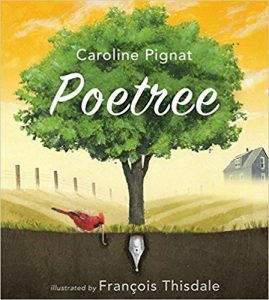 Rich verse about the lifecycle of a tree all beautifully illuminated by François Thisdale. Finding books for babies and toddlers can be challenging – when On My Walk came out it was a welcome storytime addition. 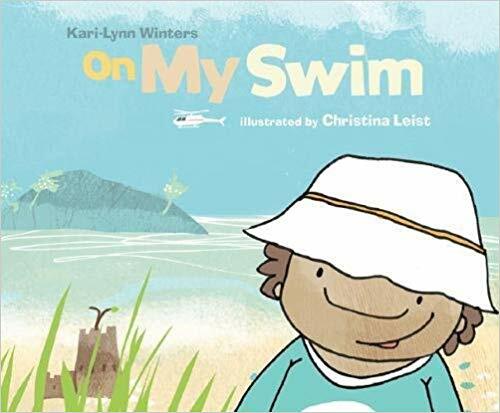 Now, author Kari-Lynn Winters and illustrator Christina Leist are continuing the series with On My Swim, On My Bike and On My Skis and we could not be more pleased! These books feature a nice mix of urban and wild environments all seen from a little one’s perspective plus a healthy dose of playful language. 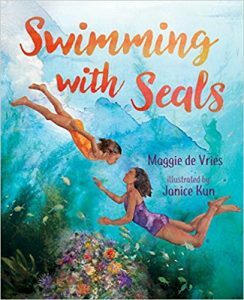 If you’ve read anything by Maggie de Vries or heard her speak you know her work is thoughtful, imaginative and real. This book portrays a girl who does not live with her mother, but does get to spend time with her, which can be both happy and painful. Though Swimming with Seals deals with a difficult topic it is lovingly rendered, accessible for young readers, and accompanied by lucious watercolour illustrations. A perfect, quiet read. What 2018 Canadian books for kids are you looking forward to? Give us a shout on Twitter at @Jbrary. The Vancouver Library Services for Children Journal Club is still going strong! We had our June meeting a few weeks ago and talked about co-designing the library with community members and barriers some community members face when accessing the library. You all know how much I care about community outreach, so this topic was right up my ally. Here’s what we got up to. What are the benefits and drawbacks of this strategy? Who is included? Who is excluded? What barriers are there to participation? How can we apply a similar strategy to our work with children and teens? The three projects were: Participator Budgeting, Central Library’s Friends, and the Dream On! Campaign. I took pictures of our large flipchart notes but they don’t translate well to a blog post. Email if interested and I can send them to you! Overall we were impressed with the level of involvement from the community in these projects though we questioned how much effort was put into recruiting members from a diverse array of backgrounds. The author didn’t really touch on this topic so it is hard to know. Some of the projects had a dual impact in that they helped the library achieve a goal and they gave community members skills they could take with them into their personal and work lives. 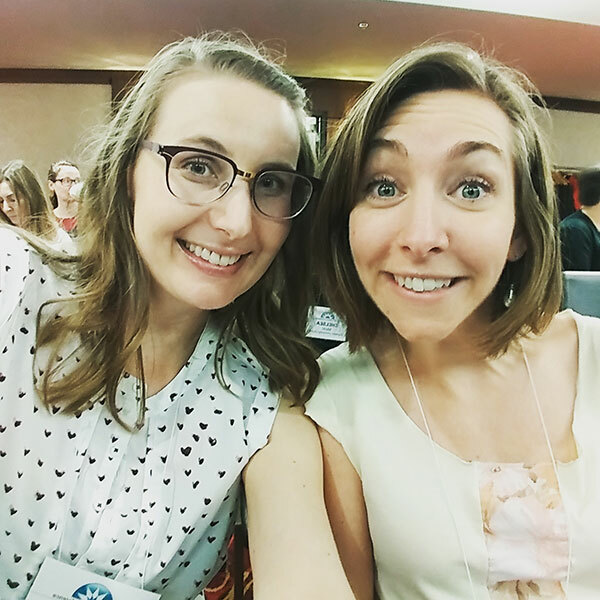 We came away with inspiration on how to get kids and teens more involved in the planning and development of our library programs. Personally, my biggest take-away was to gather feedback with a purpose. Know what you’re going to do with the feedback before you design and administer a survey. We’ll be taking a break over the summer but plan to be back in September with another article. Check out the Library Services for Children Journal Club website to stay up-to-date!